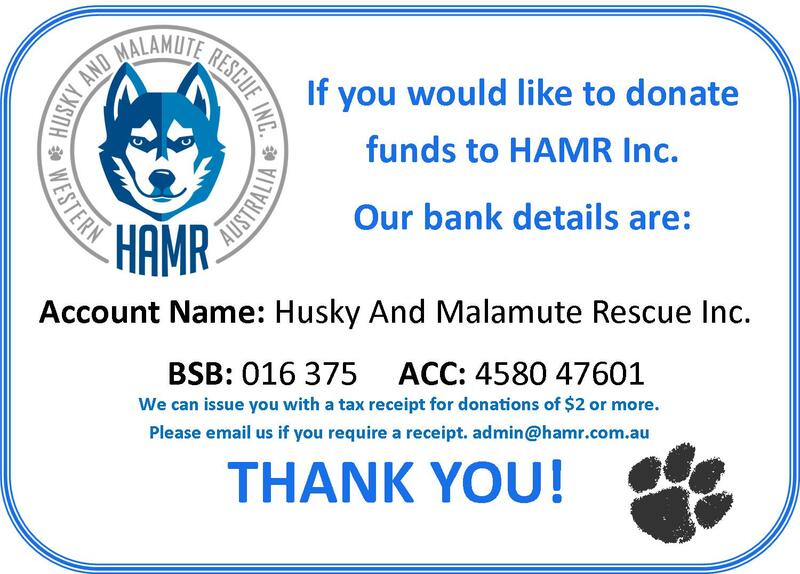 You can help – HAMR Inc.
For Husky And Malamute Rescue Inc. to run smoothly and successfully we work with a passionate team of volunteers. Our foster families are the backbone of our organisation, without these awesome people HAMR wouldn’t exist. They supply the rescue dog with much needed love, attention and time, whilst us here at HAMR go to work searching for the right forever home for the fluffbutt. We have successful processes in place to ensure we match up our rescue dogs with the right foster family. It is equally important to us that the foster family’s current circumstances, in regards to pets and children, are taken into consideration before placing one of our rescue dogs with them. 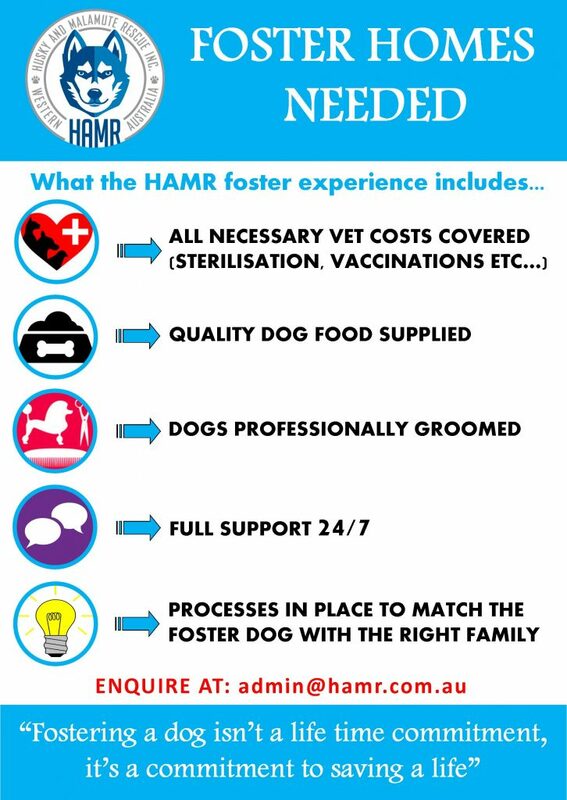 The HAMR foster experience includes all necessary vet costs, quality dog food supplied for the duration of the foster dogs stay, all dogs get professionally groomed and most importantly you are guaranteed 24/7 help from our HAMR team. Emergency – 2 to 3 week stay whilst we setup a permanent foster home. Temporary – 2 to 3 months. Full time – Undetermined time duration. Whilst our dogs are in foster care we start our reviewing process of our applicants. During this time the dogs will get their needed vet work attended to, such as vaccination, sterilisation and general check-up. All of our foster homes go through a screening process including a fence and property check. We do this to ensure that our rescue fluffbutts are being fostered in a safe and loving environment. As we are spread out across Western Australia, many of our rescue dogs need to be transported to various destinations. Some transport jobs may be a quick vet stop or a groom drop off, whereas other transports may take more time in getting our rescue babies to their new foster homes. This consists of a few little but important jobs such as conducting fence and property checks (we provide all the information and checklist needed) and helping at fundraising events. If you would like to work with us in our plight in rescue and rehoming these beautiful fluffbutts, and are able to help fill one of our volunteer roles, please head to our forms section and fill in the appropriate form. Again we can’t stress enough how important and appreciated our HAMR volunteers are to us. Without their time, help and support we wouldn’t be able to achieve everything we already have and what we aim to accomplish in the future.